With high-pressure experiments at DESY's X-ray light source PETRA III and other facilities, a research team around Leonid Dubrovinsky from the University of Bayreuth has solved a long standing riddle in the analysis of meteorites from Moon and Mars. The study, published in the journal Nature Communications, can explain why different versions of silica can coexist in meteorites, although they normally require vastly different conditions to form. The results also mean that previous assessments of conditions at which meteorites have been formed have to be carefully re-considered. The scientists investigated a silicon dioxide (SiO2) mineral that is called cristobalite. „This mineral is of particular interest when studying planetary samples, such as meteorites, because this is the predominant silica mineral in extra-terrestrial materials,“ explains first author Ana Černok from Bayerisches Geoinstitut (BGI) at University Bayreuth, who is now based at the Open University in the UK. "Cristobalite has the same chemical composition as quartz, but the structure is significantly different,“ adds co-author Razvan Caracas from CNRS, ENS de Lyon. Different from ubiquitous quartz, cristobalite is relatively rare on Earth's surface, as it only forms at very high temperatures under special conditions. But it is quite common in meteorites from Moon and Mars. 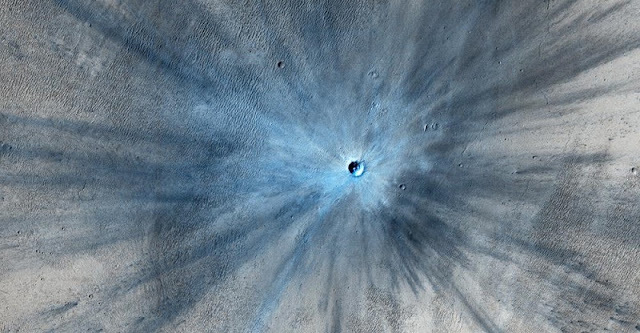 Ejected by asteroid impacts from the surface of Moon or Mars, these rocks finally fell to Earth. But if cristobalite is compressed unevenly under what scientists call non-hydrostatic conditions, it unexpectedly converts into a seifertite-like structure, as the experiments have now shown. This structure forms under significantly less pressure than necessary to form seifertite from ordinary silica. “The ab initio calculations confirm the dynamical stability of the new phase up to high pressures,” says Caracas. Moreover it also remains stable when the pressure is released. “This came as a surprise,” says Černok. “Our study clarifies how squeezed cristobalite can transform into seifertite at much lower pressure than expected. Therefore, meteorites that contain seifertite associated with cristobalite have not necessarily experienced massive impacts.” During an impact, the propagation of the shock wave through the rock can create very complex stress patterns even with intersecting areas of hydrostatically and non-hydrostatically compressed materials, so that different versions of silica can form in the same meteorite.